Indian mynas (Acridotheres tristis), frequently referred to as common mynas, are South Asian birds with vast geographic grounds, including native lands of India, Vietnam, Afghanistan and Kazakhstan, and many other countries internationally, from Australia to the United States. Indian mynas are drawn to warm locales, especially those near reliable water. They are not picky about habitat, however, and are found everywhere from deserts to farmland. Indian mynas have reputations as serious pests. They're fierce and pushy, driving away other birds from sustenance, regular consuming cultivated crops and messy waste in and around human establishments. The midsize black, brown and white creatures are easy to spot due to the vivid yellow coloring that surrounds their eyes. Indian mynas are usually between 9 and 10 inches long, and weigh between 3 and 5 ounces. Numbers for the species are growing, notes the IUCN Red List of Threatened Species' 2012 analysis. Indian mynas are classic omnivores -- they're as far as can be from choosy diners. The general diet for these territorial birds is made up of bugs, bug larvae, snails, grains, seeds, worms and fruits. Indian mynas are big on invertebrates. Their favorite insects include flies, grasshoppers, locusts, caterpillars and beetles. They also enjoy flowers and their nectar. Indian mynas often turn to seeds and fruits when they do not have sufficient invertebrate access. Outside the Indian mynas' basic diet, individuals of the species frequently dine on rodents, tiny reptiles, fish and crabs. 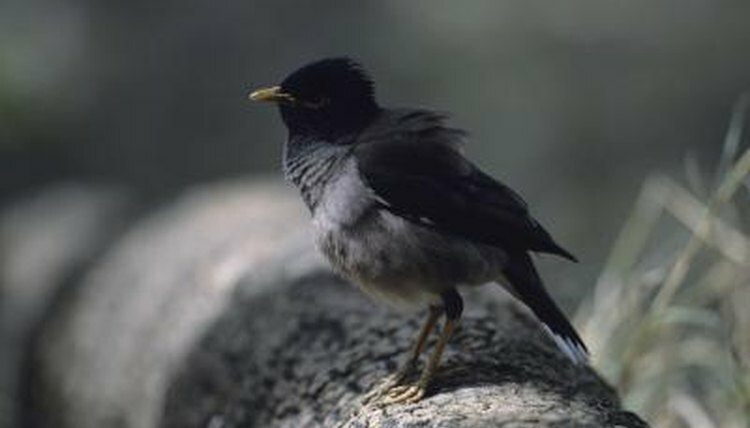 Indian mynas often go after eggs and juveniles of other bird species, namely 'Akepas, which are forest birds that hail from Hawaii. Indian mynas have a tendency to scour human establishments for remnants of food. Not only do they often scavenge roadkill, they also often look for sustenance in farms, in garbage dumps and even directly around human residences. Dog food, for instance, is something that Indian mynas readily consume. The species' "pest" tag comes largely from the bird's agricultural crop consumption and havoc. They regularly indulge in the seeds and fruits of plants like apples, tomatoes, papayas, breadfruit, blueberries, strawberries and pears. Grain crops also are susceptible to these myna birds' big appetites, whether rice or corn. The bulk of the species' food searching activity takes place on the floors of their environments, but they also sometimes seek out food within trees. Indian mynas remain in small social units during times of feeding. They sometimes seek out sustenance in duos.